November is a transition month. Days are getting shorter, nights are getting cooler, the mosquitoes are gone and it is snowing in other parts of the country. I have even started turning off the AC on some days, for the first time in 7 months..
Water temperatures currently are in the high 70's.. 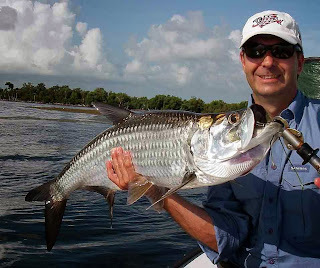 Which means we can target the glamour species, tarpon, permit and bonefish. Winter cold fronts can lower water temperatures. If water temperatures drop below 70, we target redfish, barracuda, sharks, cobia, lady fish, sea trout, jack crevalle, etc.. There is always something fun to fish for here in the lower Florida Keys. Cooler water temperatures bring lots of big cudas on to the shallow flats to warm up. I love fishing barracuda.. These fish are a blast! Lighting fast, violent strikes, wild jumps and blistering runs.. If you have a heart condition, you may want to stick with something tamer...They can out jump a tarpon and out swim a bonefish.. Top speeds are 25 mph..
As I mentioned in past reports.. We have been finding more and more redfish on the flats.. They don't mind the cooler temperatures. Fished several days with Trey while he was vacationing at Little Palm Island. We had some very windy days, but we were able to fly fish for redfish out of the wind and score. Mention this promotion when you book your charter and get a free hat for you and your fishing partner.